The 2018 Bournemouth Marathon Festival took place on Saturday 6th and Sunday 7th October. The festival, which included a Marathon, Half Marathon 10K, 5K, and four Junior races, attracted in excess of 15,000 runners, each with their own reason for running. The festival kicked off at midday on Saturday with the Kids’ Kilometre for 3-6 year olds. The morning rain did not deter hundreds of enthusiastic youngsters who took on the challenge along the Bournemouth coast, setting the tone for a fantastic day of running. The 1.5K Junior race for ages 6-8 was next up, with the Jack Cooper first home in a time of 6 minutes and 8 seconds, while the first female was Isabella Garavini in a time of 6 minutes and 25 seconds. The Junior 2K for ages 9-12 took place at 1.30pm, with Jon Pepin taking the win in a time of 7 minutes and 16 seconds. The first female was Daisy Wilkinson in a time of 7 minutes and 34 seconds. The final Junior race of the day; the 5K for ages 11-18, saw two new course records set. Ben Brown raced to victory in a time of 16 minutes 57 seconds and the first female home was Holly Wilkinson in a time of 19 minutes and 1 second. Continuing a breathless day of running, the Supersonic 10K saw yet another course record set as David Long raced home in an outstanding time of 30 minutes and 42 seconds. He was followed by Nick Marriage and Ben Lewis. The first female across the line was Bethan Francis, she finished in a time of 37 minutes and 45 seconds. Georgia Wood and Serena O’Connor took second and third respectively. As dusk fell in Bournemouth, runners gathered for the final event of the day; the Supernova 5K. At 7pm, thousands set off, clad unashamedly in fluorescent gear and each donning an LED head torch, creating a stunning visual spectacle. Emerging from the darkness to take first place was David Clark who finished in a time of 16 minutes and 10 seconds, denying eventual second placer Bayley Massey a third consecutive victory in the event, after wins in 2016 and 2017. Jamie Grose took third spot. Lara Atkinson took her fourth successive victory in the Supernova 5K, racing home in a time of 18 minutes and 53 seconds. Izzy Rabjohns was second in 20 minutes and 12 seconds, with Lexie Brown finishing just fractionally behind to take bronze in 20 minutes and 13 seconds. Also amongst the Saturday runners were superstar siblings Alanna and Taylor Dobson who completed the Kids’ Kilometre and the Junior 2K for the event’s official charity Macmillan Cancer Support. They were raising money in memory of their Grandad who sadly passed away from cancer before they were born. Their Dad Mike inspired the kids’ amazing fundraising efforts by running the 5K, 10K, Half and full Marathon at last year’s Bournemouth Marathon Festival! Read more on their JustGiving page here: www.justgiving.com/fundraising/taylorandalanna. Layla Chandler ran the BMF Junior 1.5K for Back Up Trust who work to transform lives after spinal cord injuries. Back Up is a charity very close to home for Layla as her good friend Kevin has a spinal cord injury and has had some amazing opportunities thanks to the charity. Find out more and donate to Layla’s cause here: www.justgiving.com/fundraising/layla-chandler. Sunday runners will have been glad to wake up to a clear, bright morning as they made their way to the start line in King’s Park. “I did not expect to win today, and this was a big personal best for me. I am training for a marathon so today has given me a lot of confidence. I loved the event, it was really well supported and well organised”. Lucy Barnes (1 hour 25 minutes and 47 seconds) and Alex Lane (1 hour 26 minutes and 40 seconds) claimed the remaining female podium spots. The final event of the 2018 festival was the Marathon, which got underway at 10am from King’s Park under brilliant blue skies. Iain was joined on the podium by Richard McDowell and David Hudson who finished with respective times of 2 hours 26 miutes and 49 seconds, and 2 hours 30 minutes and 40 seconds. Taking the second and third podium spots were Juliet Champion (3 hours 1 minute and 21 seconds), and Becky Atkinson (3 hours 1 minute and 37 seconds). Further down the field were some incredible people running for some equally incredible causes. “I decided to run and raise money for PAPYRUS after my cousin made the decision to take his own life on Wednesday 2nd May 2018. I find it hard to believe that until that horrible day I didn’t even know that suicide is the biggest killer of men aged 27 to 35. You can read more and donate to Daisie’s JustGiving page here: www.justgiving.com/fundraising/daisie-eleanor-bryan. “My beautiful Nephew Benedict was born sleeping in 2014 and during this incredibly tough time for my family, SANDS were there for all of us every step of the way, and continue to provide support and information. By entering the Marathon it was my chance to raise vital funds for SANDS in Benedict’s memory, to ensure that any other family who go through this trauma can also be supported as we have been. “The death of a baby is not rare. Every day in the UK around 15 babies die before, during or soon after birth. That means every 90 minutes a family is faced with the devastation of the death of their baby. You can read more and donate via Emma’s Facebook page here: www.facebook.com/pages/biz/Emmas-Marathon-Mayhem-169178100456975/. Sean Doran completed an incredible four events at this year’s festival, taking on the Supernova 5K and Supersonic 10K on Saturday, and the Half Marathon and Marathon on Sunday. He was raising funds for Asthma UK. You can read more and donate here: www.justgiving.com/fundraising/seandoran150. “Yet again, I am left inspired by the dedication and courage of the participants who, having completed weeks and months of training, started and finished their very personal challenge this weekend. The journey that leads to this kind of accomplishment can often be both emotionally and physically tough and I want to say a massive congratulations to everyone who ran and who have contributed to over half a million pounds that has been raised for charities. “My next thank you goes to all of the local residents and businesses of Bournemouth and Poole who supported the runners across the route. A very heartfelt thank you also reaches out to the 1000 strong Event Team who have been there to support and ensure the safety and wellbeing of the runners this weekend. 2019 early bird entries open now! For those who want to do it all over again next year, early bird entries for the 2019 event are open NOW! Grab a discounted entry for the 2019 Bournemouth Marathon Festival on 5th & 6th October today. Early bird entries will be available until midnight on Sunday 21st October: www.bournemouthmarathon.com. The Bournemouth Marathon Festival will take place on the 7th and 8th October, and there is still time to register for a charity place with Macmillan Cancer Support, the official charity partner of the running festival. If you are not sure that the weekend-long celebration of running is for you, then maybe you will be inspired by a Bournemouth woman who will be running in the 5k, 10k and the half marathon. Amy Spreadbury who completed the Half Marathon in 2015 and in 2016 in aid of Macmillan Cancer Support has this year decided to run the 5k, 10k and the Half Marathon. Amy the Director of Sales at the Village Hotel in Bournemouth says “Cancer has affected so many of my loved ones. Sadly, I have lost two relatives this year and three other people close to me have been diagnosed with cancer. Luckily, we have had family and friends to support us, but not everyone does. So that is why I am running for Macmillan Cancer Support because nobody has to suffer alone, and with the fantastic work Macmillan do, nobody has to”. 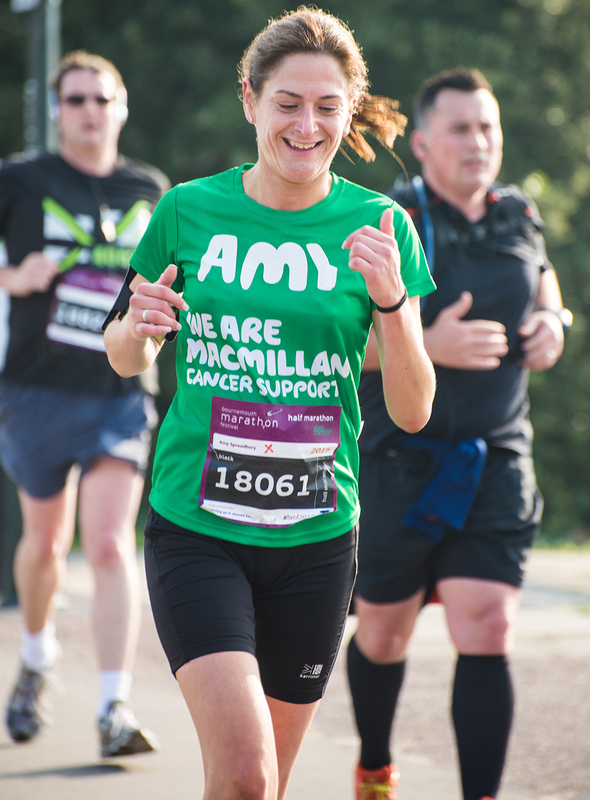 If you have been inspired by Amy’s story, then visit Team Macmillan’s page on the Bournemouth Marathon Festival website to register for a place. CHARITY RUNNER Emma Richman is gearing up to take part in the Bournemouth Half Marathon to raise funds for Target Ovarian Cancer in memory of her mum, Linda, who tragically passed away from the disease aged 64. 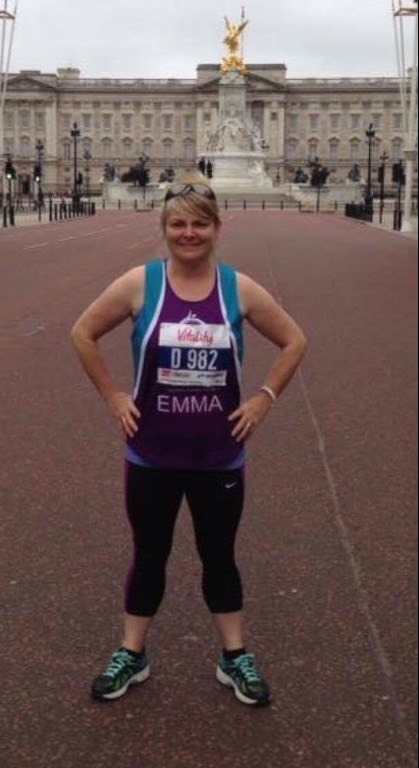 Emma decided to run the half marathon to raise awareness of the signs and symptoms of ovarian cancer, and to raise funds to help aid future research. “There’s 14 of us running and we’ll all be wearing charity vests to show our support. I’m not a natural runner so this is a real challenge to me but with the support of my friends, I know I can cross the finish line where my dad will be waiting.” said Emma. Emma is also keen to highlight the common symptoms which are associated with this particular type of cancer, urging women to visit their GP if they notice any changes. Having a bloated tummy, feeling full and the need to go to the toilet more than usual are all symptoms associated ovarian cancer, especially if you have any of these symptoms more than 12 times a month. “Nothing can prepare you for the sudden death of a parent but I knew when my mum, Linda, passed away I had to do something about getting this information out to women. My mum had every single sign & symptom but as a family we were unaware of them at the time.” said Emma. The Bournemouth Marathon Festival takes place on Saturday 7th and Sunday 8th October and with eight races on offer over the two days, there’s something for all ages and abilities. If you’d like to donate to Emma and her team, you can do so here www.justgiving.com/emma-richman3. If you are inspired to run for charity or a cause close to you heart you can sign up online at www.bournemouthmarathon.com/charity.